Need info about how we handle Credit Cards? We are now a CardConnect partner, click here for more info, or click here for the Early Update. GoAntiquing! Point of Sale runs on all Windows operating systems since Windows XP. See the FAQ for more info. NOTE: If you are looking for the latest update for the software, just click GoAntiquing! Point of Sale v3.1.634 - Update Package. Easily ring up both inventoried and uninventoried sales by entering Dealer ID + Description, by scanning, etc. Many reports! Sales, rent, fees, invenotry, customer activity, etc. You can add a cash drawer, pole display, label printer, and barcode scanner! We have been providing this specialized point-of-sale solution to antique malls, antique shops, consignment stores, and collectible boutiques since 2002. We designed this program with you, the shopkeeper, in mind. In fact we sat down with a shopkeeper just like you, and an accountant, and determined the features that such a program should have. Our goals were ease of use, speed of taking a sale, accuracy, paperwork reduction, and leveraging the power of the internet. These goals along with feedback from our customers, have driven each new version of the product. This product includes all features you would expect. Our competition starts out with a basic product priced higher than ours, and then as you add features, they add cost. Not us. You get it all for one price. The best way to get started is to download the program using the blue Free Trial button, or if you've already tried it, and want to buy it, click ! Let your Dealers get their own reports online! Are you flooded with requests from Dealers who just "pop in" to get their weekly or daily "How am I doing" sales reports? Upload your sales to our secure web portal! Dealers can login and run sales reports. Priced at $1/Dealer/Month* - you buy in bulk and reallocate. Dealers can login and run sales reports from a range of dates (limited to amount of data on hand, base subscription includes 3 months of sales history). Enter your Dealers email and the system will send them a Daily Summary or Detail report. Leave messages for all or for certain Dealers that they will see when they login. Shop level reports exist for metrics such as Top Dealer By Sales, Sales by Day of Week, etc. Download the Gateway Administrators Guide here for more detailed information. Distribute the Gateway Dealer Guide here to your Dealers (also shown in the Footer area of the Dealer Login page). Priced at $1/Dealer/Month* - you buy in bulk and reallocate to your Dealers (Example: 25 dealers for a year costs $300, $1*25*12). * $1/Dealer/Month is based on purchase of 2 months or longer subscription. Purchasing 1 month of service costs $2/Dealer/Month. * You must already be a customer of GoAntiquing! Point of Sale to subscribe to this service. Backup your Sales and Settlement database to our Data Center! We provide a simple data backup service to our customers for $10/month*. We keep 90 consecutive daily full backups for you (a full backup is ALL the data in your database, which could be several years of data, so every day we backup that file that grows every day). Our server is located in a very cold and windy room full of other servers in Fremont, CA. And we pay extra to backup our server to the Amazon S3 cloud - we take data backup seriously! Don't want our service? Please backup your data somewhere! King Richard's Antique Center, Whittier CA (Los Angeles area) has been using GoAntiquing! Point of Sale on three of their PC's since May 2009. As Southern California's largest Antique Center (3 levels, 47,000 sq ft, 260 dealers, and up to 7 employees on the floor), Chuck and Martha Garcera were looking for a modern, turn-key system, to replace their old point-of-sale system. 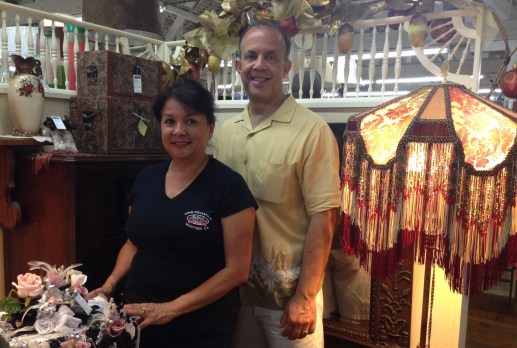 "We are glad to have found GoAntiquing! Point of Sale and are very satisfied with the performance, capability of the program, and outstanding customer support(support staff have been known to email us at midnight with answers to our questions - now that's customer service!). Our store's prior point-of-sale software was approximately 15 years old and required the software programmer to make a "house call", at over $100/hour, to make simple changes such as sales tax. That helped justify why we needed to buy the GoAntiquing! Point of Sale system. GoAntiquing! Point of Sale lets us make simple changes/updates, such as the sales tax increases, within 5 minutes at no extra charge, we love it." Need to load your Dealer list, Reseller list, Customer list, or Inventory from another program? Use our 'Import Contact Data' or 'Import Item info' wizard to load from Excel, Text (CSV or TAB), Access, or FoxPro (including dBase and ACT!). If you need to move from one of our competitors products this tool will make that process fast and painless. Do your dealers like to shop each others booths? Use the new Account payment type to deduct purchases from the buying dealers Account. Naturally you will need to approve these on a case-by-case basis, since not all dealers are profitable every month, but this will help you in your paperwork. How often do your dealers ask you "What are customers looking for?" Use the Want List feature in the Customer module to add items that a customer is looking for, use the Want List module in the Reporting group to search, and if you subscribe to the GoAntiquing! Internet Gateway, you can publish the list so your registered dealers can view it. No customer information is published, so your dealers cannot try and sell outside the shop. What do you do when a dealer does NOT make enough sale to pay their rent? Not a good situation for anyone. With GoAntiquing! Point of Sale you have full control over the Settlement process. From month to month any outstanding balances are carried forward as a debit. Do you want to do inventory management and barcode scanning? Using GoAntiquing! Point of Sale, you can scan either UPC (consumer packaged goods) barcodes or you can create your own. Using a combination of the Dealer ID# and a unique Item ID# the software will produce barcodes that you can print either to Avery style sheet labels or for the case of a hanging tag label, to a two-sided label format using a Label Printer (such as the Zebra Eltron 2844). So you have some Dealers who are constantly late paying Rent, or who do not make enough Sales to cover Rent? Some Dealers need 'encouragement'! Do you charge late Fees? If so, use the Add Late Fee feature in the Settlement module to automatically add these fees to all Dealers who owe you rent at the end of the payout period. The following list is optional point-of-sale hardware equipment that is available at our partner POSGuy's website. Although not strictly considered to be POS hardware, a PC running some variety of Microsoft Windows is required. See this FAQ for more info. You do not need a touch screen type PC, though that will certainly work, we just don't recommend spending the extra for it unless you want to.. If you already own point-of-sale hardware it can almost certainly be used with GoAntiquing! Point of Sale. We do not sell this hardware, you must purchase separately. For a minimal configuration all you need is a laser or inkjet printer to print receipts and reports. You will get a better checkout experience, faster, more professional, with at least a receipt printer. Upgrade from just the receipt printer to other hardware as needed. All items in the list below are tested as compatible with GoAntiquing! Point of Sale. NOTE: We do not recommend this for customers running Windows 10 64-bit edition. Some customers have reported failure to open the drawer under Windows 10. Program this scanner for proper operation with GoAntiquing! by printing this document and following instructions. All point-of-sale hardware displayed is priced by and available at POSGuys.com.